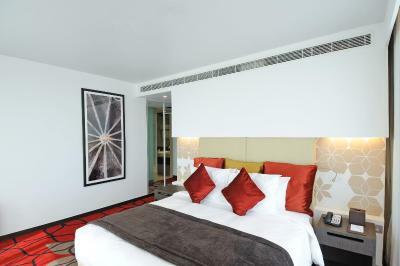 Lock in a great price for Crowne Plaza Yas Island – rated 8.3 by recent guests! Great hotel, lovely location to enjoy Yas Island. A good selection of bars and restaurants both on site and within walking distance. Fab pool area, very well-maintained. Rooms were very comfortable too. Would highly recommend. The staff were extremely helpful and polite. They all went out of their way to ensure we had a wonderful stay. At dinner one evening we asked if coffee was included as part of the meal and it wasn't. The gentleman went out of his way to make sure we had our coffee anyway. The concierge was so amiable and went above and beyond expectations to ensure we had all the information we needed to enjoy our visit. Applauds to all of you! Amazing hotel! We enjoyed our stay and definitely will come back! The sundowners (pool bar) is good and serves a good variety of spirits and cocktails, the staff is friendly and attentive. And they are on Zomato gold. The view to the beach is delight! Price is superb for the area and included breakfast. The buffet is large with plenty of options. 10/10 would stay again. Everything from staff, facilities, cleaness... etc. Crowne Plaza Yas Island This rating is a reflection of how the property compares to the industry standard when it comes to price, facilities and services available. It's based on a self-evaluation by the property. Use this rating to help choose your stay! Set along the Links Championship Golf Course on Yas Island, this luxurious hotel features a 100 feet outdoor pool with furnished terrace. 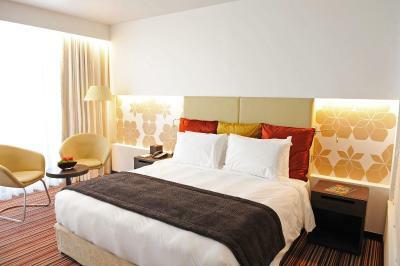 It offers spacious guest rooms with balconies, and free Wi-Fi. Crowne Plaza offers a variety of restaurants and bars. Guests can enjoy Lebanese cuisine at Barouk, or visit Stills which serves a wide variety of international draft beer. All day dining is available at Jing Asia. The hotel also has a pool bar and lobby lounge. The hotel has a state-of-the-art gym which includes a racquetball court and steam rooms. In the evening the hotel provides live entertainment. 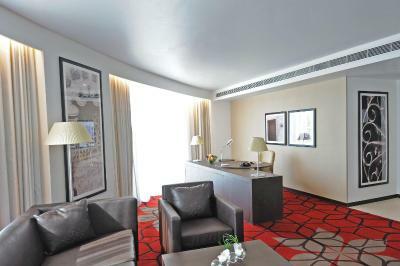 Crowne Plaza Yas Island is located 5 miles from Abu Dhabi International Airport. Yas Waterworld and Yas Beach are a few minutes away. Free private parking is available on site. 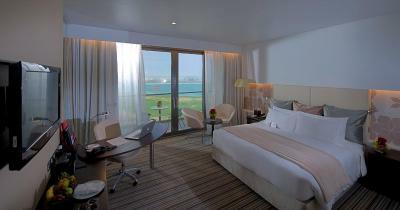 When would you like to stay at Crowne Plaza Yas Island? 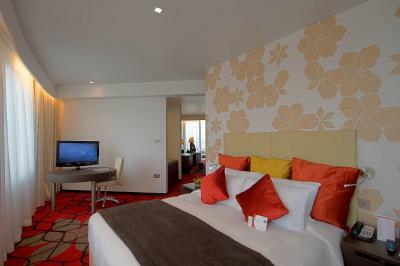 This air-conditioned room has a satellite TV, a mini-bar and a private bathroom as well as plaza view.. 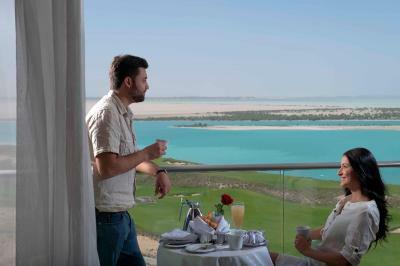 Features a balcony overlooking the pool area, the sea or the Yas Links Golf Course. Bedding configuration and smoking preference are subject to availability. This air-conditioned room includes a satellite TV, a mini-bar and a private bathroom. - Free soft drinks, tea and coffee. Kindly note, children under the age of 12 are NOT permitted to use the Club Lounge, but may enjoy breakfast in Jing Asia, the main dining restuarant. 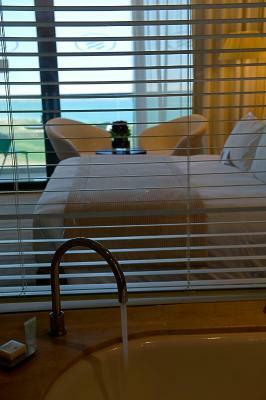 Featuring a balcony, this air-conditioned room includes a satellite TV, a minibar and a private bathroom. 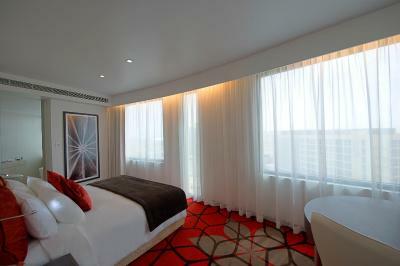 This air-conditioned room has a satellite TV, a mini-bar and a private bathroom as well as plaza view. This spacious suite includes a separate living area with a flat-screen TV. Featuring a balcony, this air-conditioned room has a flat-screen satellite TV, a minibar and a private bathroom. 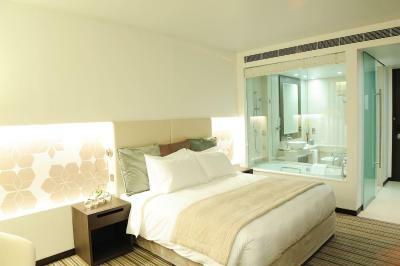 This air-conditioned suite features a small sitting area, a desk and a bathroom equipped with a bathtub and a shower. Leisure travelers and families have Yas Island's attractions at their feet, with everything just a short walk or complimentary shuttle ride away. Crowne Plaza Abu Dhabi Yas Island is the perfect place for the ultimate Yas experience, all year long. The location? 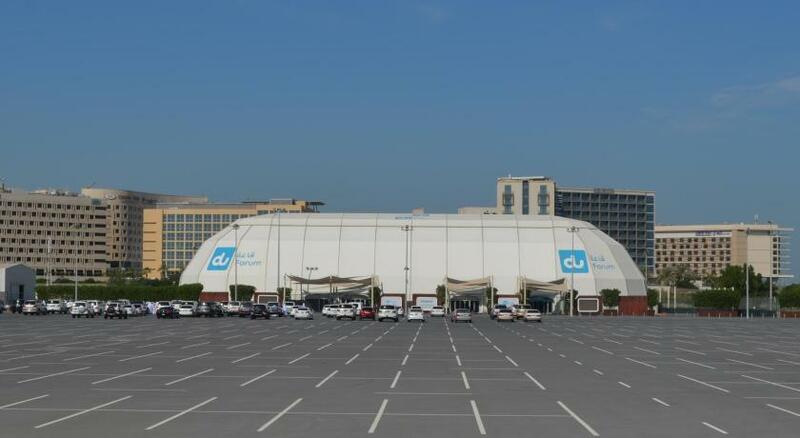 Perfectly convenient for Abu Dhabi International Airport (10 minutes), downtown Abu Dhabi (25 minutes), Dubai (45 minutes) as well as all the GCC countries. So come and experience the unique Yas lifestyle, where meetings are a pleasure and leisure is bliss. House Rules Crowne Plaza Yas Island takes special requests – add in the next step! Crowne Plaza Yas Island accepts these cards and reserves the right to temporarily hold an amount prior to arrival. Please inform Crowne Plaza Yas Island of your expected arrival time in advance. You can use the Special Requests box when booking, or contact the property directly using the contact details in your confirmation. Some finishes (like tiles) are falling apart due to age. Room was average, no balcony. Bathroom finishing was poor with messy patches of silicone in various places. There is also a lot of construction happening next to the property. Requested a baby cot 4 weeks in advance and then none were available for my stay so we didn't sleep much, staff were unapologetic. A brand like Crowne Plaza needs to deal with these situations better in future. My issue wasn't resolved by staff and I was offered no incentive to return therefore we wont be staying again. Breakfast on Friday was chaotic and the areais clearly not big enough for the amount of rooms. Certain stations had run out of food and drinks, not enough staff clearing tables. Public areas could have been a bit cleaner and the shower wasn't the best.